The race for Montgomery County Executive is starting to draw some attention from the press, but relatively little has been written about the upcoming election for the County Council’s four at-large seats. That’s too bad considering the historic nature of the race. The council has never had three open at-large seats since its current structure was created in 1990, but it does now thanks to term limits. Combined with the open District 1 seat, the council will have four openings in 2018. Whoever wins those seats, along with the next County Executive, will be running the county for as long as the next twelve years. We are fourteen months out from the election and the race is just now beginning to form, but we are reasonably sure of one thing: candidates who have run before, even if they lost (respectably), will have an advantage over those who have not. That’s because of two reasons. First, they have electoral experience and don’t have the often-steep learning curve of brand-new candidates. Second, they will have leftover support, relationships and name recognition from their prior races. Why do we emphasize this? MoCo electoral history is full of candidates who lost and later came back to win. Consider just a few examples. Silver Spring attorney Steve Silverman took on all three incumbent District 20 Delegates in 1994 and lost by more than 2,000 votes. But he captured a council at-large seat four years later and finished first for reelection in 2002. Silverman, as shrewd and canny as they come, is still a player in county politics as a co-founder of the advocacy group Empower Montgomery and as a successful lobbyist. 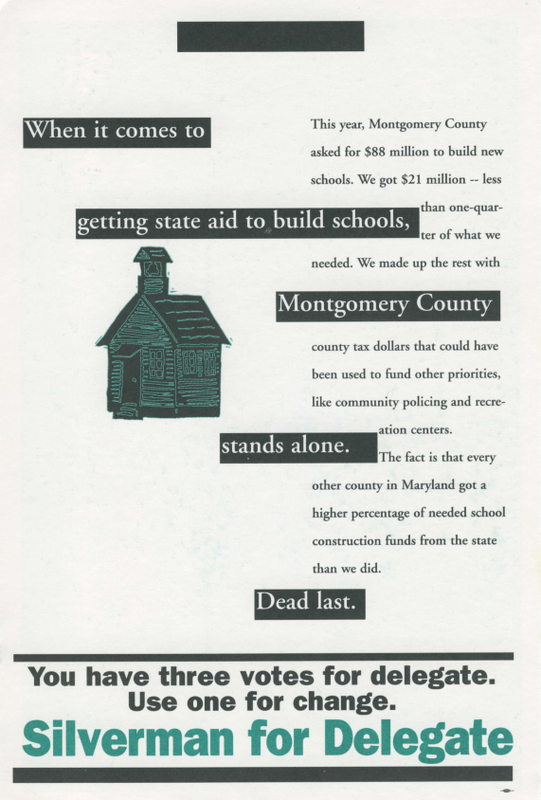 A 1994 Silverman mailer about school construction. Some things never change. 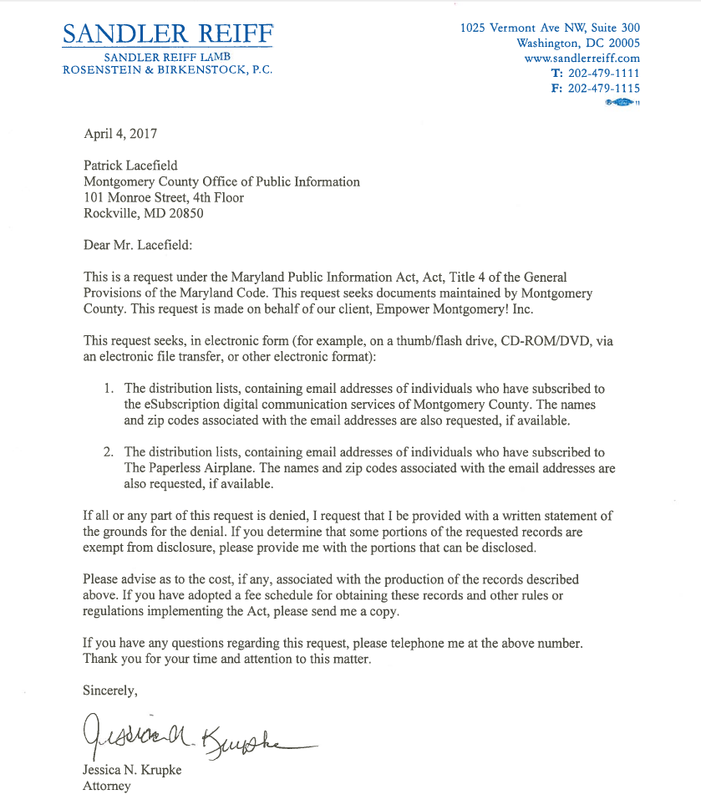 Former Common Cause of Maryland Executive Director Phil Andrews ran for an at-large council seat in 1994 emphasizing his work on curbing lobbyists and big campaign donors. He finished sixth, but came back four years later to knock out District 3 incumbent Bill Hanna. Andrews would go on to serve four terms on the council. A 1994 Andrews mailer. Reading his comments on his time at Common Cause, it is no surprise that he would create the county’s public campaign financing system twenty years later. Energy sector lawyer Roger Berliner ran in the 2000 District 1 special election primary and lost to Pat Baptiste, who subsequently was defeated by Republican Howie Denis for the seat. Berliner came back six years later to beat Denis and has represented the district ever since. A Berliner mailer from 2000. He has much better glasses now! Former Rock the Vote political director Hans Riemer lost a 2006 open seat race in District 5 to school board member Valerie Ervin. Four years later, Riemer finished second in the at-large race and is the only incumbent eligible to run again. 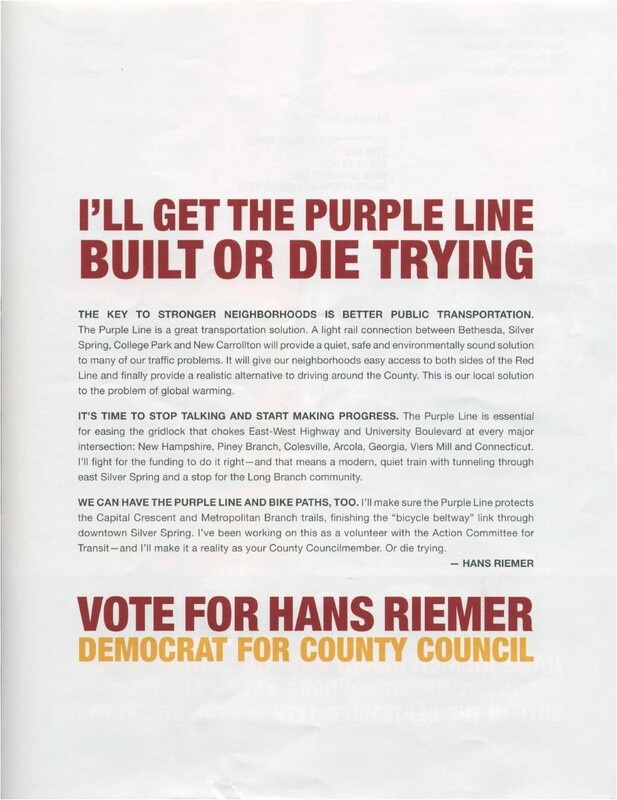 Riemer vows to build the Purple Line in 2006 or die trying. For the sake of his wife and two kids, we hope the project is allowed to proceed! 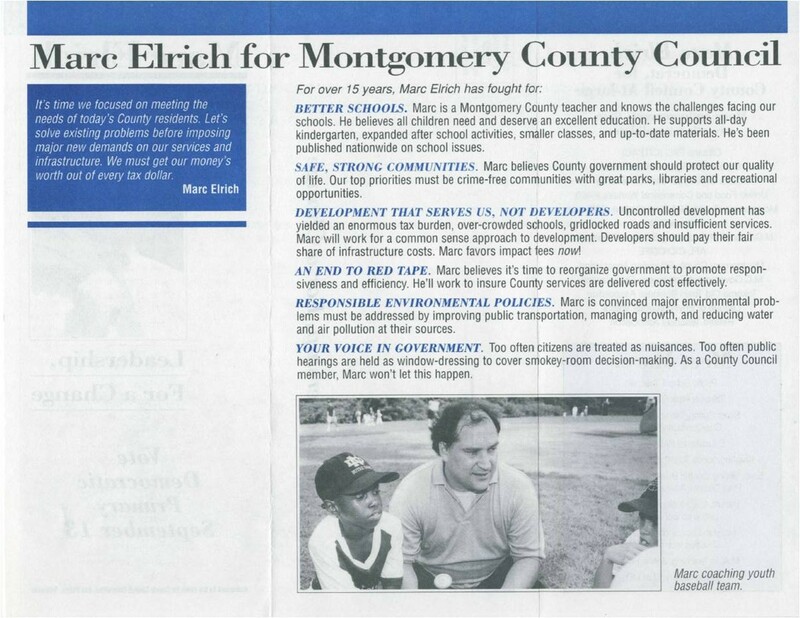 Former MCPS teacher and Takoma Park City Council Member Marc Elrich is the patron saint of persistent candidates. Elrich ran four straight times for County Council before being elected at-large in 2006 and has finished first in the last two elections. Elrich’s longevity, tenacity and consistency of message will make him a formidable candidate for Executive. 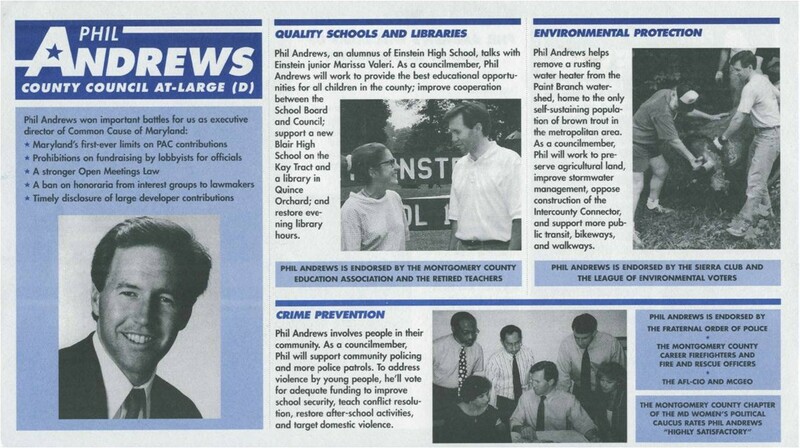 An Elrich mailer from 1994. What did we say about things never changing? We love history like many Seventh State readers. But what does this have to do with 2018? We’ll explore that in Part Two.